Yesterday I decided to cook for a change. On weekdays, I’m usually so tired after a long day at the office that we have started going out to eat a lot. I therefore try to cook at least once on the weekends. I really liked it. I tend to like lentils anyway, and the vegetables came out great. Plus, it was really easy to make. I even saved some so that I could come home today for lunch and heat up a serving. I’ll post the recipe after the break. While preheating the oven to 350 degrees, heat the oil in a large oven-proof casserole dish or stew pot. Add the leeks, garlic, and celery and cook for 3 minutes. Add the carrots, parsnips, sweet potato, lentils, tomatoes, herbs, stock, and salt and pepper. Stir well. Bring to a boil, stirring occasionally. 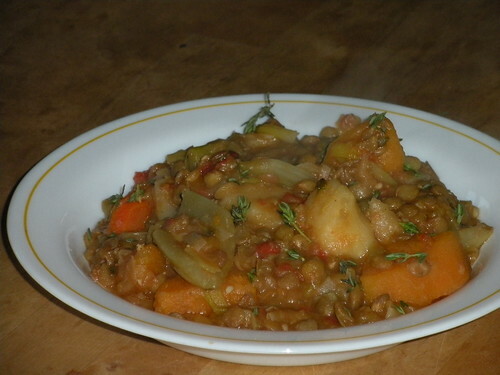 Cover and bake for 50 minutes or until lentils are cooked and tender. While it is cooking, remove the casserole from the oven and stir the vegetables once or twice so that they are evenly cooked. Remove the casserole from the oven. Mix the cornstarch with 3 T. cold water in a small bowl then add it to the casserole. Stir until the broth thickens. Simmer gently for 2 minutes. Spoon into bowls and garnish with remaining thyme.